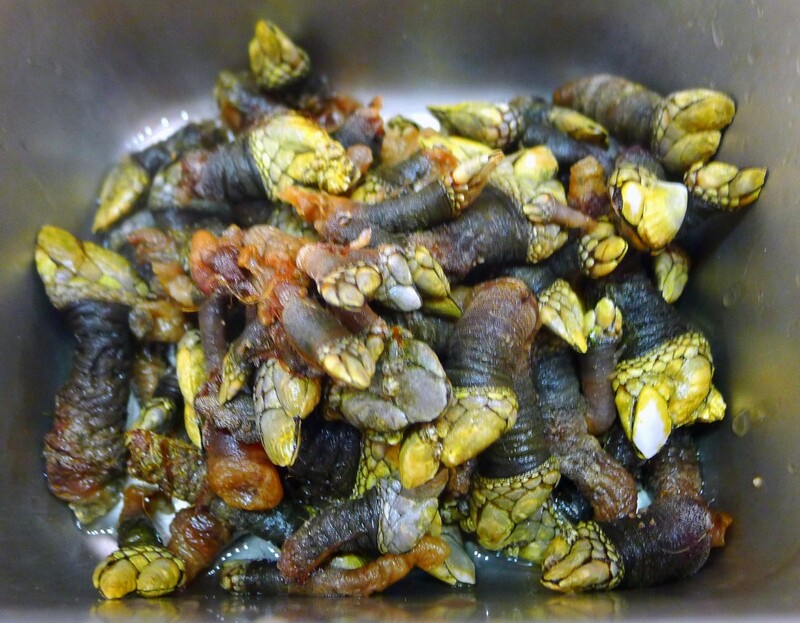 Percebes – goose (or gooseneck) barnacles — are the most expensive form of seafood in the world. I hadn’t heard of them until I was at the running of the bulls in Pamplona in Spain’s Basque Country in the mid 2000s. It was not until a half decade later, in Galicia – near the Costa da Morte where they are harvested – that I tried them again. And then, two weeks ago, my wife and I went for a beach walk off of our house in Baja at low tide and saw them growing from a rock on the sand south of Rosarito. All we had to do was harvest them. There are two reasons percebes are the most expensive seafood in the world (about $80.00 per pound). One is that they are utterly delicious, with a flavor and texture about half way between crab and razor clams, with a toothsome texture and a briny sweetness. The other reasons they are so expensive is suggested by the name of the place in Galicia they are harvested: the Costa da Morte (the Coast of Death). Percebes are filter-feeding crustaceans that attach to rocks in heavy surf. Harvesting the barnacles is treacherous work because of where they grow: large, slippery boulders jutting out into the ocean, exposed to the waves. One wrong move or one big wave and the best you can hope for is to slice open your hand. Percebes are bizarre looking creatures with a long neck – the edible part – encased in a black sleeve with a white and craggy, hat-like shell that looks like a dinosaur’s toe. There are other visual comparisons possible but we at www.sdfoodtravel.com strive for a G rating. As a tapa in the north of Spain, percebes are served in the most simple way possible: boiled simply in salted water – bring a pot filled with just enough water to a boil, add the barnacles and when the water comes back to a boil remove the shellfish — and offered with an aioli (garlicky mayonnaise) or allioli (a similar Spanish preparation without egg) or melted butter for dipping. The traditional technique for eating percebes is to peel off the black skin, revealing the pale pink neck meat. Using the dinosaur toe as a handle, you put it in your mouth and pull. I do it slightly differently, holding the shell with one hand I grasp the skin at the end with my front teeth and pull off the sleeve. The barnacles are both delicious and also fun to eat once you get the hang of it. 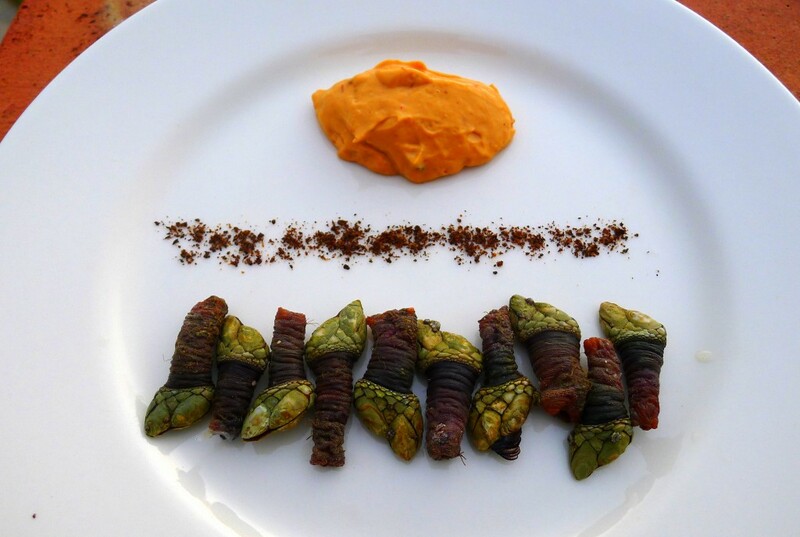 But percebes – like all shellfish – take well to more elaborate preparations. Seafood and pork have a natural affinity and one of the best forms of pork in Spain is chorizo sausage. Mexico also has its own version of chorizo, moist instead of dried and usually made of beef. But Mexicans do make a pork chorizo that is left moist, an excellent cross between the Spanish and Mexican versions. I wanted the fresh taste of peas to underline the sweetness of the percebes, while also grounding the dish. A bit of blanched seaweed (connecting seafood to land vegetable), and chorizo flavored sherry butter, ties the whole plate together. 1. Cook the percebes. Clean the percebes, separating them, removing any clinging dirt, mussels or seaweed. Bring a pot of salted water – just enough water to cover the barnacles to a boil. Add the barnacles and allow the water to come back to a boil. When it does, remove the percebes and rinse them under cold water. 2. Cook the peas. Bring a large pot of water to a boil (more than enough to cover the peas). Cook peas in boiling water until tender, about 2 minutes. Drain well and transfer to a medium bowl. 4. Cook the percebes and chorizo mixture. Add the olive oil to a sauté pan over medium heat. When it is warm add the minced shallots and cook for two to three minutes and add the minced garlic, continuing until the shallots are just translucent. Add the chorizo, breaking it up, and cook for two to three minutes draining off all excess fat beyond two tablespoons. 5. Finish the peas. Add the peas with the butter to a sauté. Cook for two minutes and deglaze the pan with the sherry wine. Remove the peas, add in the two tablespoons of chorizo liquid and stir to combine. 6. Plate the dish. Carefully spoon one to two tablespoons (depending on whether the dish is to be an appetizer or main) of the peas just offset from the center of the dish. 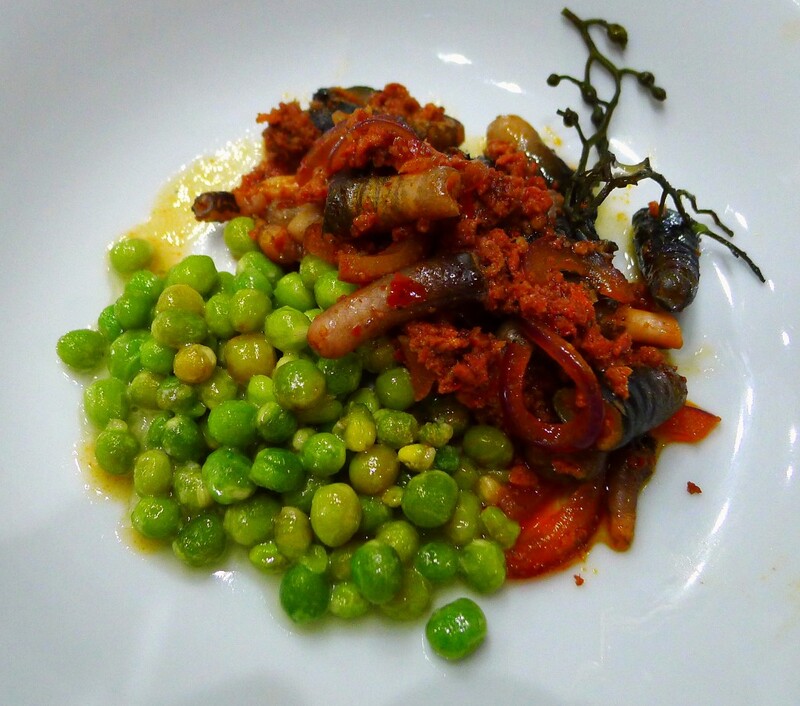 Add a somewhat larger amount of the percebes/chorizo mixture contiguous to the peas on the other side of the plate. Arrange the seaweed on the plate attractively. Spoon some of the sherry-butter-chorizo sauce around the plate (with a light hand). 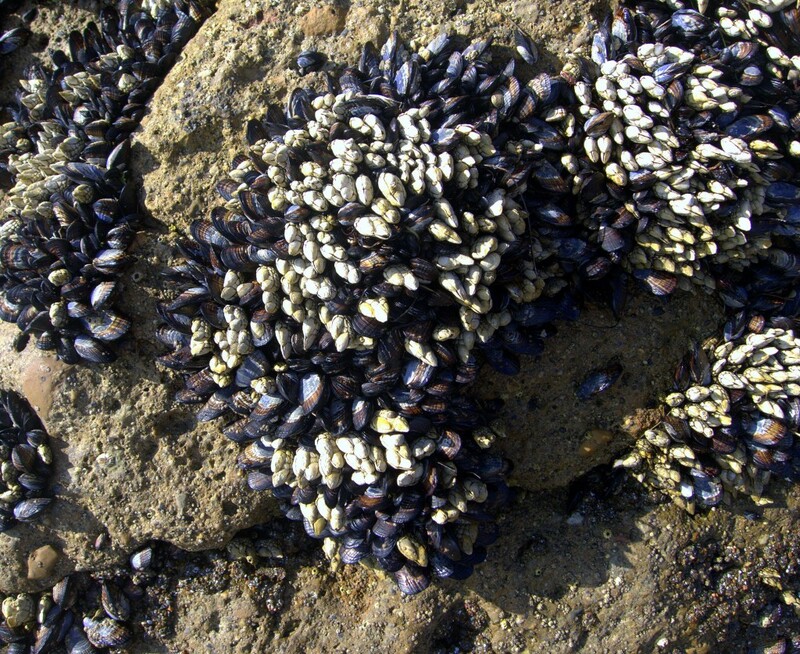 It’s illegal to harvest goose barnacles in California. One to two tablespoons of what? I live in San Diego and wondering how to purchase Percebes from Baja in time for Thanksgiving. Any recommendations? Eatoregonbaranacles.com they sell them legal and licensed all year available. Ryan, I also learned that Catalina Offshore down in Morena has them. Free off Monterey bay. Granted it must be connected to seaweed or drift wood. Not a rock…or its technically not allowed. Or off an old boat or even rope! Had three dozen this week.